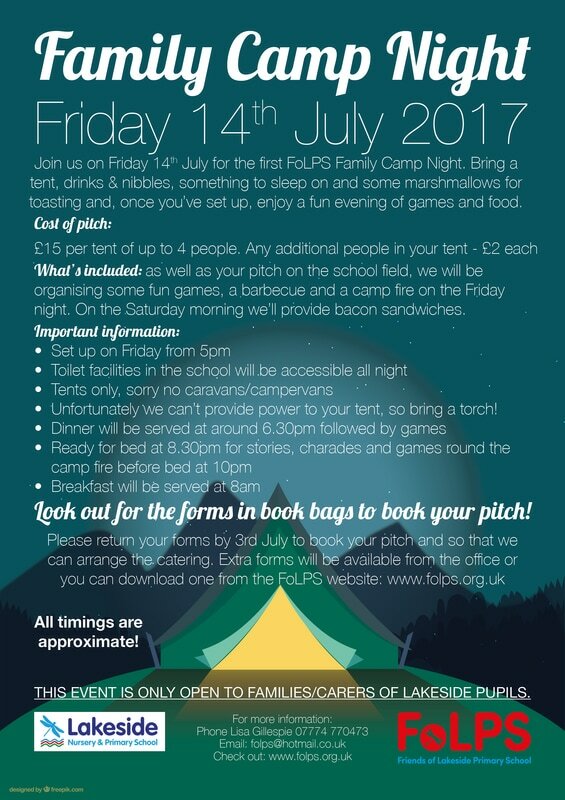 On Friday 14th July 2017 we will be holding the first Family Camp Night. Bring a tent, drinks & nibbles, something to sleep on and some marshmallows for toasting and, once you’ve set up, enjoy a fun evening of games and food. As well as your pitch on the school field, we will be organising some fun games, a barbecue and a camp fire on the Friday night. On the Saturday morning we’ll provide bacon sandwiches. Unfortunately we can’t provide power to your tent, so bring a torch! Look out for the forms in book bags to book your pitch. Extra forms are available from the office or download one here. Please return your forms by 3rd July to book your pitch and so that we can arrange the catering.